Long-blooming, heat and drought tolerant daisies, available in a wonderful range of colors. 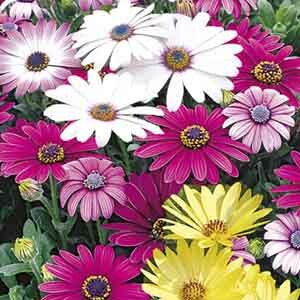 Use one to perk up a mixed container or plant them in quantity to create a sea of cheerfulness in the landscape. Perfect for containers, hanging baskets, window boxes and landscapes. Looks great in rock gardens. The perfect choice for beds and borders. Tolerates hot, dry conditions. Does best in light, well-drained soil. Allow soil to dry between thorough waterings. Remove faded flowers for best display.